I wonder if I became so overweight because of the amount of food I ate? I don’t think my weight loss was entirely due to my fitness. It helps. There’s a sense of self-control that comes from remembering you’re going to be exercising later, and after you’ve exercised, my body instinctively wants better foods. The problem might have been consuming too much food because even eating too much good food can be bad for you. I think it depends on what you’re doing that day and how you’ve been feeling. On an average day, if you’re feeling hungry, try to drink some water instead. My 1-gallon of water daily intake has certainly been helpful in reducing my compulsive urges to overeat. Hunger for me is more of a need to be doing something or a stress-coping mechanism. I wonder if drinking water follows that same sort of thought pattern? Maybe to a lesser extent? That’s part of how I’ve been addressing my overeating tendencies. Next is whether I’m actually hungry. Sometimes instead of actually being hungry, I’m actually just bored. What I’ll instinctively do is to eat something, whether it’s some peanuts at my desk at work, a snack bar at home, or a bigger meal just because. The way I identify I’m actually hungry versus bored is whether I’m feeling a little more spaced out than normal. If my reflexes are duller or I’m not feeling as motivated, then most likely, I’m hungry. This is where pacing helps too. Don’t cram the food into your mouth. Savor it. Taste it! Next is a little controversial. I firmly believe in exercise. It’s not a magic pill and it won’t be immediate. Here’s the thing: being overweight or obese means that you have excessive calories stored up in your body. Even if you burn off some of the calories you consume today, eventually, more of those long-term calories will burn off. The problem is that we tend to judge ourselves against other people’s appearances. They appear to be healthier or in better shape than we are, so we might feel inferior. Don’t think like that! We shouldn’t be comparing ourselves to others. If any comparisons should be made, it’s between where we were and where we are going. My fitness goals aren’t to be in amazing shape. I just want my body to be as functional as possible for as many sorts of situations as I want to attempt. I don’t have much interest in martial arts or weight-lifting right now. If I should find an interest, then I am in much more of a physical and mental condition to enable me to try those potential hobbies now than I was a year ago, or even two months ago. It’s just constant effort and discipline. It’s not easy and it’s not hard. The long-term results are too far away to consider possible and the short-term results are too close for us to see clearly. Inspirations: Going back to single-topic essays for the next few weeks to catch up on my backlog of essays and short stories to edit and publish, this is the time to explore some heavy topics about fitness at length. To address fitness stats: I held the same weight as last week but have been less cognizant of certain things. I’ll try harder. 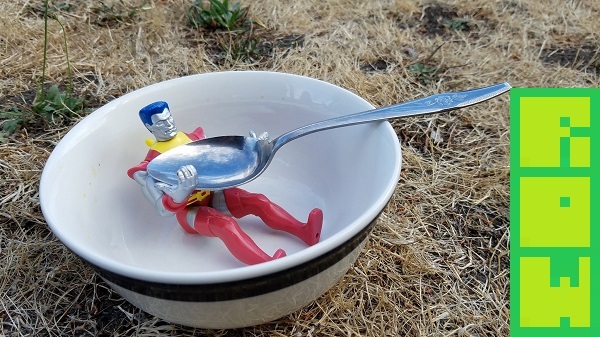 Photo: Just Colossus being eaten… hey! Wait just a second… isn’t that… vore?